This post (really) concludes my series about Pope Francis' long interview with the Jesuit journals. Part 4: what is going on with the reference to the life and family issues. I have tried in all these to find a way for Traditional Catholics to understand Pope Francis and to make use of his perspective to make a case for the things they want to defend. In this post I examine the one, short, reference to the 'Vetus Ordo' (as Pope Francis calls it). It comes at the end of a paragraph about the Second Vatican Council. Asked about the Council, the interviewer is taken by surprise at how little Pope Francis wants to say about it. It is just this. I have already noted how, on another occasion, Pope Francis has made clear that he regards the traditional liturgies of East and West as God-centred, and that this is a good thing, which 'we have lost a little' in the West with the reform. That doesn't mean he thinks what is gained does not compensate for what is lost, from this paragraph it is clear he thinks it does. But he does not take the view, which many progressive liturgists have taken over the years, that the traditional liturgy is either theologically problematic or pastorally a dead-end. Which is good, obviously, since those views are absurd. What he is expressing here is another familiar concern, expressed in Bugnini's book 'The Reform of the Liturgy'. Bugnini writes about the early Traditional movement, and how there were calls for permission for the Old Mass both from rather fanatical groups and perfectly orthodox ones (pp295-7). He appears to conclude that permission was withheld because of the former: a nice example of kicking the cat to punish the dog. Indeed, in practice it forced the orthodox traddies to choose between hearing the Traditional Mass in the context of the more extreme groups or not hearing it at all. Anyway, this self-defeating policy is over, thank heavens, and Pope Francis approves of this change, but he is still worried about 'the risk of ideoligization' of the Vetus Ordo. Let's think about what that means. There are, of course, groups totally at odds with the Church which celebrate the Traditional Mass, or some approximation of it; if anyone is ideologizing the Mass presumably they are, so they can be our paradigm. Old Catholic groups didn't adopt the 1970 Missal and have done their own thing since 1870, Jansenists since even earlier, though these groups have in many cases made their own changes. Feeneyits also went into schism before the Council (many in fact have been reconciled since). Then there are Sede Vacantists, the main body of whom split away from the SSPX in the 1980s, and the even loopier 'conclavists' who elect their own Popes. These are all a pretty rum lot and mainstream Traditional Catholics wouldn't touch them with a bargepole. I'm not even going to bother explaining who they are or what they think; anyone can satisfy a morbid interest with the help of Google, but they are numerically insignificant, and really shouldn't become the focus of an obsession. They are, however, a really clear case of people using the Traditional Mass who have lost the plot doctrinally. My question is: in what sense can we say there is an 'ideologization' or 'exploitation' of the Mass going on here? In two senses, perhaps. First, apart from the Old Catholics / Jansenists (who can be very liberal) they like to claim that theirs is the only valid Mass. In this way they make an ideological issue out of the Mass. Secondly, they exploit it, in the situations in which they alone offer the Traditional Mass in an area, by attracting people who are (at least at first) simply interested in experiencing the Church's authentic liturgical traditions. They make the Mass a bait for drawing people in to quite distinct theological issues, where their views are heterodox. Clearly, the way to combat both aspects is to make the Vetus Ordo more and more widely available in the Church, with the permission of the hierarchy. This undercuts the argument that the authentic Catholic theology implicit in the EF is denied by a heretical hierarchy, and it undercuts efforts to attract Catholics to schismatic celebrations by offering something which can't be found in the Church. In short, the danger of 'ideologization'/ 'exploitation' is a danger in not having enough Traditional Masses celebrated, NOT a danger which arises from having too many celebrated. There is, however, another kind of ideologization/ exploitation of the Mass in the Church today, that of liturgical abuses in the Novus Ordo. In most, if not all, cases, common abuses have a theological rationale which is at odds with the theology of the Church. 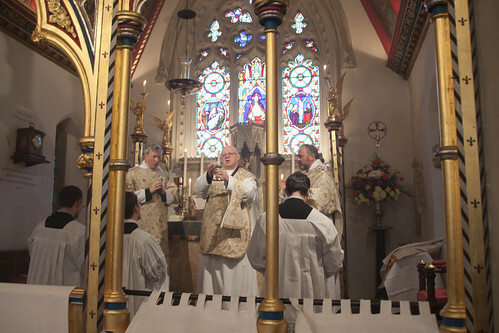 For example, cramming the aisles with Extraordinary Ministers of Holy Communion has a theological motivation (in the minds of the ideological initiators of these things), namely an attempt to downplay the role of the priest; this is also achieved by many other abuses, such as that of having lay people receive communion in the sanctuary, or having the priest go into the nave all the time. Many abuses, similarly, downplay the Real Presence: I'm sure we can all think of examples. 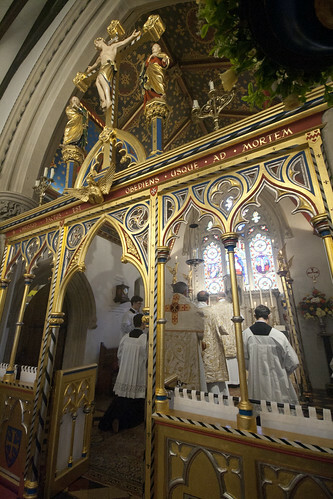 It seems to me that these are even better examples of 'ideologization' / 'exploitation' of the liturgy than those noted above, since they can be used to impose false theological ideas on the Faithful through the very ceremonies of the Mass, and not just over a cup of tea afterwards. It is not surprising that such abuses have been condemned so strongly by Bl Pope John Paul II and Pope Benedict. If we are concerned, as we certainly should be, about the liturgy being utilised to convey an ideology at odds with the Faith, then we have to look very seriously at these abuses and, if we can, do something about them. 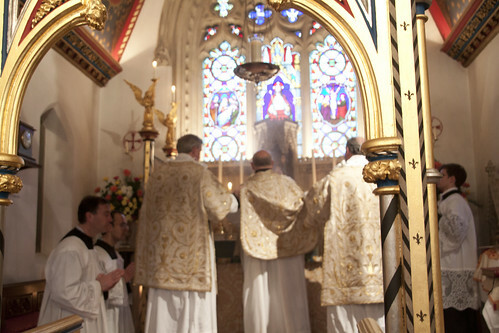 As far as the Traditional Mass is concerned, the answer is again to have more and more of it, since its ceremonies tend to made clear precisely those things which the abusers want to obscure, and to teach precisely what the abusers want to deny, notably about the special role of the priest and the Real Presence, but also about the reality of sin, grace, transcendence, the role of art and beauty, and so on. 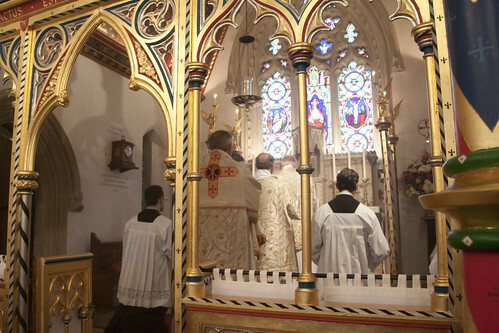 In short, the widespread celebration of the Traditional Mass is an effective defence against the ideologization of both the Old and the New liturgy. Such ideologization can only flourish where the Vetus Ordo is little celebrated in a diocese and where it is regarded, consequently, as something peculiar and either wrong-headed or at least to be steadfastly ignored. For in fact, as the FIUV Position Papers have shown on many topics, it has much to teach the Catholics of today. On a final point, I'd like to say that I rather like the Holy Father's revival of the term 'Vetus Ordo', if only because I believe in a terminological free market against those who fanatically insist on the term 'Extraordinary Form', and have even suggested that to use any other terms is disloyal to the Holy See. If we can say 'Vetus Ordo', obviously we can also say 'Novus Ordo', which contrary to popular belief has never been a term of abuse, but just what Pope Paul promulgated (the 'New Order of Mass', Novus Ordo Missae). Let's stop arguing about words, and address the realities to which they refer. Thanks for the lucidity expressed in this series of posts. Thank you Mr Shaw, this piece is very insightful. I would venture to say though that what the Pope does himself might be a good dictionary for what he means to say. Nevertheless, your perspective will be a very useful sword of truth. Regarding the term Novus Ordo, this is an official name given to a fabricated liturgy. There never was a "Vetus Ordo". This is a novel reference given to the Extrordinary Form. Do you not think it might give a false impression that you can throw out the old and bring on the new. Also is it not quite easy to mistakingly think in terms of two different Rites as opposed to two different forms and then confusion concerning permission to celebrate due to ordination in the Rite. Priests are ordained in a particular Rite and do not have automatic permission to say Mass in a Rite in which thay have not been ordained. Maybe Pope Francis was confused on this very point when dealing with the Franciscans? Most importantly, do you not think Pope Benedict is smarter and most probably holier than you, do you not think it wise to default to his judgement in this matter (I don't think this would put you in the Ultramontane territory:-)). Words describe realities, and a bad choice of word can distort perception. I would add, the obvious thing is to stick to the official title. There was no apparent reason for Pope Francis to make use of a new title except maybe that he wanted in some way to distance people from the context in which the title "Extraordinary Form" title was given. I am aware of Pope Francis's expression of approval for SP '07 on his own restricted grounds. Those grounds however are not the same as Pope Benedict's. Has not Pope Francis, in his treatment of the Franciscans, wounded the freedom given to the Church by Pope Benedict. Is it not clear that he rejects the freedom given to the Church as envisaged and enacted by Pope Benedict. For these reasons I think it very important that we stick to the official term "Extraordinary Form". Thank you very much for this series. sorry, this is nuts. Pope Benedict was not issuing a 'judgement' that we should all stop talking about the 'Old Mass'. He says nothing of the kind. It has always been a term applied to the TLM by both sides in the debate. Pope Benedict himself talks of the 'former liturgical tradition', that might make it sound it is over and done with, but the legislation clarifies the point. Now, it is not nuts. Pope Benedict was quite purposeful in naming the forms of the Mass. He could have taken a much more obvious "Vetus Ordo" way out if it did not have implications. In his judgement he considered it important to name them as he has. This was the judgement he made and the judgement to which I was referring, apologies if that was unclear. I would have no problem with the 'former liturgical tradition' and would not equate that with a different or Old Mass. Do you know what distinction exists between "Ordo" and "Rite"? I have read somewhere that the meaning is equivalent. Do you know if this is correct? If you follow the link in the post on this question you'll see more of my explanation on this point. Nowhere does Pope Benedict say we should stop using all the other terms for the Vetus Ordo which were in use at the time of the Motu Proprio. He introduces a new term because it is a technical legal explanation of its status: that's all. In Spain the EF is refered to as Vetus Ordo, it could be the same in other Spanish speaking countries. I think it could be that simple, the term the Holy Father knows it by. And I had heard English-speaking traditionalists before Summorum Pontificum use the term "Vetus Ordo" quite positively in, what I thought, was simply a parallel to "Novus Ordo." Thank you, as this makes it even clearer that nothing negative was probably meant by the pope's use of the term. Kurt, Ordo translates to Rite. 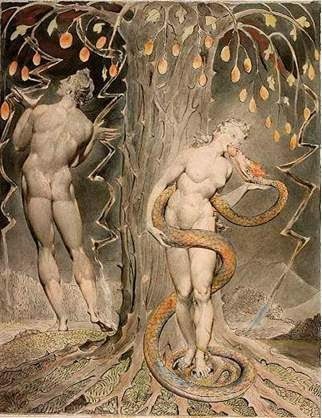 So Ordo Paenitentiae is the Rite of Penance(see vatican website). Dr Shaw is claiming that it is quite fine to say Novus Ordo and Vetus Ordo which mean New Rite and Old Rite respectively. It was the case that before Pope Benedict's ruling people were calling the Mass all sorts of names. 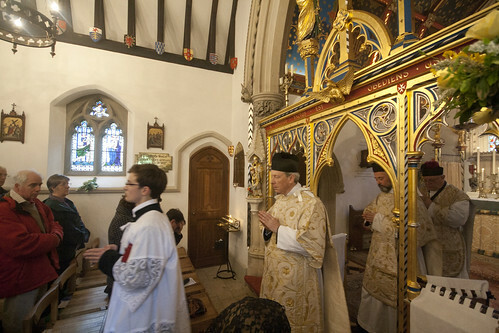 The abrogated rite, the old rite replaced by the new rite the TLM etc.... They were using these titles in the absence of clarification. Do you not think that now this clarification has been given that the sensible thing is to take it onboard. The Pope had declared legally that there are not two rites but one with two forms. Now if Dr Shaw wanted to call it the "Vetus Form" I would have less of a problem with that, likewise with the use of "Novus Form" because those titles do not undermine the Popes ruling. The best thing to do is to maintain the use of Ordinary and Extraordinary Form because with those titles comes the reality of SP07. These titles originated in a legal document that many in the Church would happily bury or at least forgotton. Please let's not make life easy for them. Pope Benedict issued no terminological clarification. He issues a legal clarification. Legally, he said, the two kinds of Mass are forms of the Roman Rite. This doesn't mean we have to stop using the alternative terminology, and he didn't say it did. Now even Pope Francis is using different terminology, you need to catch up with reality and stop arguing about words. Genuine question... you write that 'the danger of 'ideologization'/ 'exploitation' is a danger in not having enough Traditional Masses celebrated, NOT a danger which arises from having too many celebrated.' Would the same logic not also apply to charismatic services then? You see, while I am most attracted to the traditional liturgy, my sister has left the Church after being attracted by HTB-style worship. There are other friends who've done the same and I fear my own parents may go the same way. Yet I find amongst many Traditionalists a steadfast resistance to accommodating their desire for a more charismatic style of worship - this may be in part because what the Church currently provides in this direction is often very poorly done (yes Fr Ray, including at WYDs) - but given that the doctrinal fidelity and religious zeal of these evangelicals far outstrips their mainstream Catholic counterparts in the West, do we not think the Church should be working harder to properly accommodate these forms of worship? I personally do have reservations about the religious corporatism that flows from the evangelical’s almost capitalistic obsession with numbers (though Catholics are sometimes no better... http://www.nytimes.com/2013/10/06/opinion/sunday/douthat-the-promise-and-peril-of-pope-francis.html?_r=0) and, as a classical musician, I have sympathy with people’s genuine reservations about popular music effect on spiritual formation - but I am nevertheless mystified by the view that such music is de facto un-Catholic, as some responders to Audrey Assad’s interview in the Catholic Herald seemed to think, and I have no problems with the praying in tongues, fellowship groups, active healing ministries and the other things associated with such services. It seems to me that if we don’t make headway in this direction quickly, many more will leave the Church unnecessarily. The question is whether Charismatic-style liturgy is spiritually beneficial or not. I'm not going to engage in that enormous question in the com-box. But since you don't seem to think it is beneficial, it is puzzling that you propose the Church have more of it. The Church doesn't (well, shouldn't) feed its flock with poisoned bread, regardless of how much people say they want it. As it happens there has been plenty of charismatic-type liturgy in the Catholic Church; there still is, if you know where to go. It hasn't stopped people leaving; arguably it has speeded up their departure, since there are limits to what even the most free-and-easy Catholic liturgy can accommodate and they get frustrated with this. Thanks for the reply, though I’m not sure my comment merited the summary: 'you don't seem to think it is beneficial'. My reference to 'religious corporatism' related to their Costa coffees and in-service commercials for upcoming 'events', which I don't see as integral to their worship, and my 'reservations about popular music' are part of wider Adornoian reservations about modern music now that it's become an industry and I don't think the likes of Cardinal Bartolucci's musical nostalgia or Messaien/Ustvolskaya-type's honest but necessarily avant-garde compositions are any more fitting alternatives for liturgical music (which, I suppose, should make me the Pius X of today). In response to your last points, the charismatic-type liturgies I’ve seen have actually been distinctly amateurish in comparison to their CofE counterparts, but I take your point about the necessary limitations in Catholic liturgy and, of course, I agree that we shouldn’t be feeding people poisoned bread! We all need liturgy, and liturgical music, which raises mind and heart to God. There are very serious arguments about what forms of liturgy and music does that. The main point is simply that those arguments have little to do with the short-term popularity of charismatic services. Forgive me for this. I am old and am renowned among my children and grandchildren for being a fusspot in relation to spelling, grammar and punctuation. (The misuse or nonuse of the apostrophe is a pet hate of mine.) I have become aware of your series only today, Joseph, thanks to Father Blake. It is marvellous. I shall certainly be a regular reader from now on. In your latest post, you have misspelt the word "ascetic" three times, a misspelling copied by Father Blake. This is a shame. The misspelling is corrected by Father Anthony Chadwick in his blog "sarumuse.wordpress.com". If ever you (or Father Blake) decide to employ a subeditor, I would be delighted to apply for the job. Thank for pointing it out. I have corrected them, and am duly mortified! If you spot any other, do let me know. This seems to assert that the Pope is expressing the same worry as Bugnini did. Is that what you mean? Well, something like it. That the TLM harbours dangerous fanatics, or can do. Sadly, despite John Paul II's deeply traditional outlook on theology and morality, the liberal elements of the Church hijacked the liturgy and did untold damage for a generation. If the liturgy is not a reflection of the Church's received understanding of morality, then we will continue to see a its continued decline. I hope you, or the LMS, will publish in pamphlet form the series of your posts on the subject of Asceticism or Mysticism. They deserve wider circulation than blogs which not everyone reads. Oh great, so that utterly discredited Marxist blowhard T.W. Adorno - whom even the real-life equivalents of Peter Simple's Stretchford University (with its notorious 27-year sociology courses) have ceased to defend - now has apologists within the Church, does he? Are we Catholics to be spared nothing? Thank you Dr. Shaw very much. It is not a question of too many or too few old rite masses. The question of fanaticism is quite beyond that. I would say without any hesitation or doubt that the traditionalist movement has in many ways become a repository for ideologism and fanaticism. One doesn't have to look far to see it. 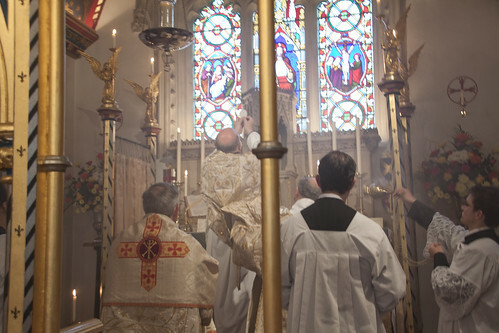 My experience of the old rite exposed me to much that was fanatical and ideological (not SSPX I hasten to add), which has something to do with why I no longer count myself a traditionalist. What words shall we use for the attitudes and people for which the Novus Ordo has become a 'repository'? Come off it, Mr Perry, the comparison would not be a kind one. And insofar as fanaticism can develop in the TLM, as I explain it is fed and encouraged by the scarcity of the Masses, which encourage a sense of persecution and isolation.